Home / Holistic Health & Lifestyle Tips / Herbs I Love to Incorporate Into My Evening Routine. Herbs I Love to Incorporate Into My Evening Routine. by Sarah BakerLeave a Comment on Herbs I Love to Incorporate Into My Evening Routine. I’m all about evening routines. I follow one every single night as it helps me wind down from a long day. Even though my evening routine evolves and changes as my mood changes or with the seasons, there’s still some non-negotiables that I always keep consistent. These are indulgent rituals like taking nightly Epsom salt baths while I read a book, using essential oils in diffusers, and nourishing myself with whatever tinctures, potions, or supplements my body is telling me it needs. We know I’m all about botanicals and herbs, and I use them almost daily whether it’s in my recipes, smoothies/juices or as standalone supplements. When it comes to herbs I incorporate in the evening, there are some botanicals that I always keep uniform. So today I’m going to discuss these herbs/supplements and why I love them so! When used for aromatherapy purposes, lavender is one of the most widely recognized essential oils to act as a natural sedative. I personally love to use it because it is linked to reducing anxiety and emotional stress. Let’s face it – a lot of us face stress in some capacity, and I personally deal with anxiety from time to time. Lavender helps bring about feelings of Zen, helping drift us off to sleep and has even been linked in studies to protect against neurological damage. I used to drink chamomile tea with almond milk and honey nightly. Chamomile is a wonderful healing flower that promotes tranquility, helps relax nerves, and is even linked to boosting immunity. There’s a reason why many folks drink it before bed, it’s a natural “soother” giving everything from our nervous system to our digestive system assistance to calm down. This root is chalk full of calming and sedative properties. 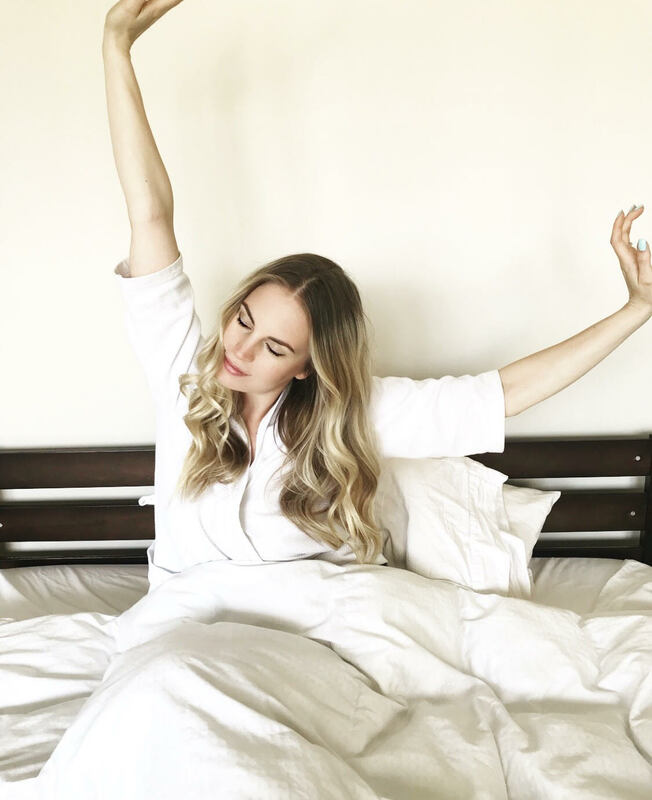 Studies have linked valerian root to helping decrease the amount of time it takes to drift off to sleep and even improves the actual quality of sleep. It works by releasing a neurotransmitter in our brain called GABA which helps calm anxiety and also promotes sleep in the evening. Other studies have also linked it to even lowering blood pressure! Lemon balm is a plant that has been used for centuries to treat insomnia and stress related effects. It’s yet another sedative herb that can help us wind down in the evening and may even combat insomnia. It’s also been linked to help improve mood and cognitive function. Melatonin is a hormone that is produced in our brain, specifically in the pineal gland. It’s responsible for regulating our sleep cycles and is widely used in supplement form. Many people supplement with melatonin when they travel to other countries due to the time difference to help them drift off to sleep due to jet lag. There are also foods that help us produce melatonin such as cherries, bananas and pineapple. Vicks ZzzQuil, has recently launched a new product called Vicks ZzzQuil PURE Zzzs Melatonin Gummies that caters to everyone who wants to steer clear of sleeping pills and find more natural ways to drift off to sleep. 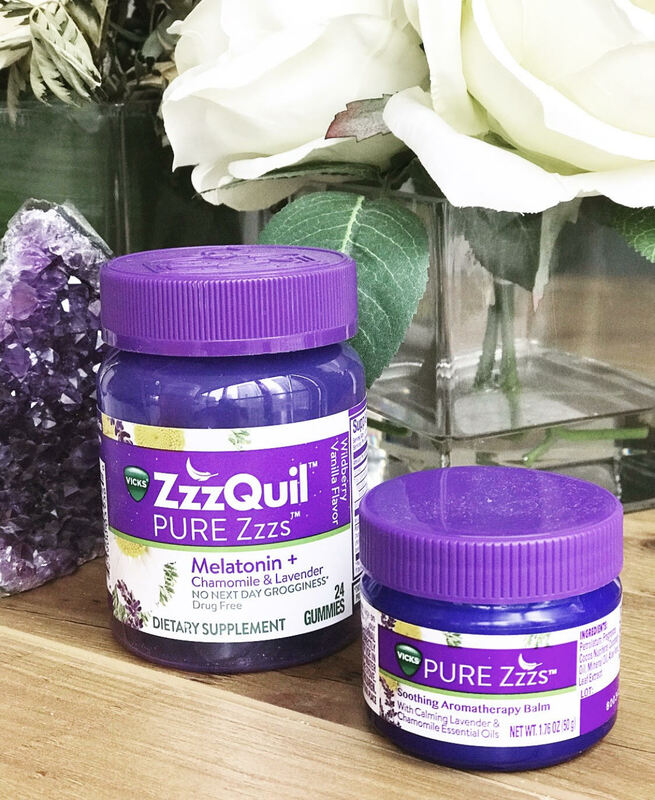 ZzzQuil PURE Zzzs come in gummy form and are made primarily of melatonin to help you fall asleep naturally*, and also a botanical blend that includes Valerian Root, Lemon Balm, Chamomile and Lavender. The gummies are vegan/vegetarian, and drug-free and are also non-habit-forming! You can take one or two gummies about a half hour before bedtime and you can use them nightly. They also taste super scrumptious as they come in a Wildberry Vanilla flavor. When I want help falling asleep naturally, I generally take a melatonin supplement, sip on chamomile tea, diffuse lavender oil, and so on and so on. Eventually this can turn into a whole process, so I was super stoked when I found out that ZzzQuil PURE Zzzs combined melatonin with all my favorite botanicals! It’s also important to note that I’ve consulted my physician before taking this supplement, and as always I advise that you do as well especially if you are pregnant or breastfeeding! You can learn more about the product at Vicks.com or scoop them up at nationwide retailers near you! If you’re like me and sometimes want to take other steps for your nighttime routine, Vicks also just launched Vicks PURE Zzzs Soothing Aromatherapy Balm that moisturizes your skin and helps provide relaxing aromas. After a long day, this is the perfect additional before hitting the sheets! The calming and relaxing scents of lavender and chamomile helps me wind down. Disclaimer: This article is in partnership with Vicks Pure Zzzs. All opinions, creative direction and writing are my own. *This statement has not been evaluated by the FDA. This product is not intended to treat, diagnose, cure, or prevent disease. Next ArticleBig Announcement: We’re Having A Balanced Baby!